Building a house for a mother and 14-year old twins, Samkelo and Bongani, this year created a platform for discipleship. Having a secure place to live planted seeds of Hope and Home in two young men who are already stepping up as leaders in their church. They are the only men responsible for caring for their extended family of nine, and seem to always be working on something. Ten Thousand Homes staff members have created a space for family-building and teaching times through Friday afternoon car washes. The twins have an incredible work ethic and desire to be a part of TTH, so some of the staff members bring their cars to Mbonisweni to have quality time, encourage their hard work, and teach the young men important lessons in budgeting. 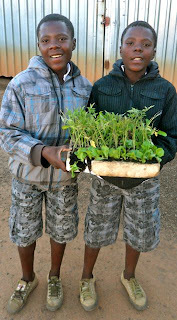 Instead of spending their earnings on sweets, Samkelo and Bongani have saved enough money to purchase seedlings and plant a garden, to pay for a school field trip, and are now saving up to open a tuck shop and sell treats and vegetables to their community.